Too much. South Africa had too much power, too much strength and too much pace for Scotland to cope with, particularly in the first half. The opening try demonstrated the imbalance perfectly as the Springboks drove over determinedly from a five-metre lineout, the bruiser that is Willem Alberts touching down. The Boks were in complete control for those opening 40 minutes, scoring another two tries, and Scotland’s malfunctioning lineout did little to help their cause – they lost five on their own throw. The pitch at half-time illustrated the fact that the home side had limited opportunities as the Scots’ turf had been brutally cut up while the Boks’ grass was left pretty pristine. Scotland became more involved in the second half and had plenty of possession, they simply lacked the cutting edge and precision to do anything worthwhile with it. The South African defence held firm in the face of numerous attacks, often driving Scotland back, and their fourth try was almost a carbon copy of the first as replacement prop Coenie Oosthuizen was driven over from another five-metre lineout. 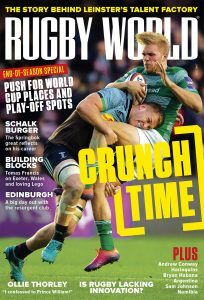 While Scotland defended gamely at times, they couldn’t match the Springboks’ physicality – and that’s what was needed if they were to make the breakthrough. In the end their attacks proved fruitless and they finished scoreless. More worringly, there was a sense that South Africa never clicked into top gear – they didn’t need to get out of cruise control. The pitch needs as much time to repair as the Scotland players’ bodies. Unfortunately for both, Australia arrive at Murrayfield in six days. Willie le Roux burst through the Scottish defence in the 32nd minute, kicked across to JP Pietersen on the wing and he dived over to score. It was the Springboks’ second try in a three-minute spell and not only did it hammer home their first-half dominance but it was a hammer blow to Scotland’s hopes of keeping the deficit within reach. 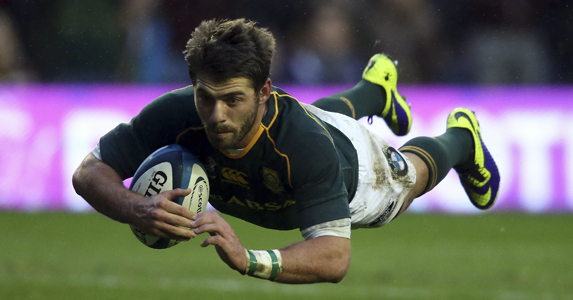 This was hardly a vintage performance from the Boks, but their full-back provided the sparkle. More often than not, he was involved in their attacking moves, his pace left Scotland floundering and resulted in two tries – one for himself, another for Pietersen – and he was solid in defence too. A real bright spark. Possession finished at 50-50 with territory 51-49 in Scotland’s favour, which showed how much more involved the Scots were after the break – but they still couldn’t make use of that ball. 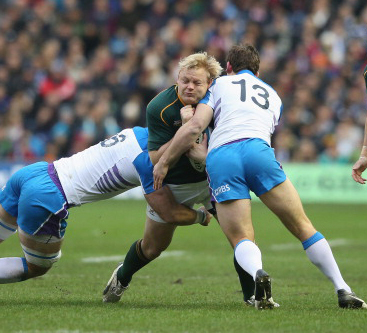 South Africa made four clean breaks to none by Scotland and beat twice as many defenders – six to three. Willie le Roux made 114 metres compared to opposite number Sean Maitland’s 22, while Al Strokosch was the game’s top tackler with 18. South Africa – Tries: Alberts, Le Roux, Pietersen, Oosthuizen. Cons: Lambie 4.